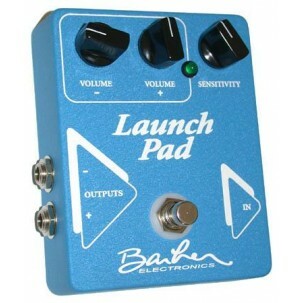 The Launch Pad is a Clean boost of the highest quality, also can be used as an excellent DI, buffer and switcher. There is no coloration from EQ or distortion. Features: Extreme headroom, dynamic, clean boost. As a clean boost and/or buffer the Launch Pad delivers the utmost in preserving your guitar's signal, while greatly reducing the degredation caused by guitar signal path, this can also save you a small fortune in audiophile-priced guitar cables. Two outputs: The Launch pad has the standard positive-phase output that most clean boost and buffers have (some inadvertantly reverse the phase). You can also choose to use the negative-phase output if you wish. This feature allows phase correcting Blackface and Silverface Fender amps, also you will be able to combine the channels for ultra flexibility and combined harmonics of parallel preamps. Each output has its own volume knob. This simple solution makes it easy for anybody to use. The main output can be used as a standard unbalanced out or balanced out for interfacing to software guitar programs and recording equipment (balanced or unbalanced DI). The standard output is an excellent TRS jack to simplify cable choice. All jacks are Switchcraft. 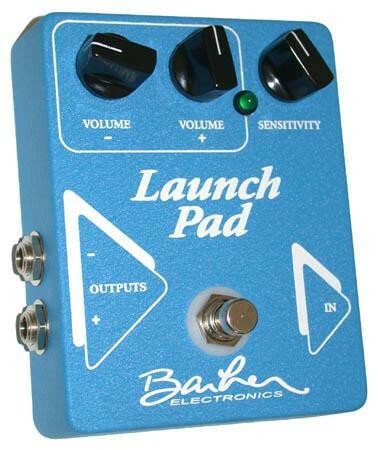 The Launch Pad has tremendous clean headroom that makes it an excellent signal buffer from unity gain to 20db boost. Two outputs also allow using the Launch Pad as an A/B with separate output levels. This also will allow you to drive separate or parallel effects chains with OD pre-driving from the Launch pad. Not only is the Launch pad super-easy to use, but you can get pretty geeky with it as your demands change. The Launch Pad can be used as a split to your tuner, this keeps the less than optimum audio performance tuner circuits out of your audio chain for much improved sonics. The internal operating voltage of the Launch pad is 24 volts; this gives far greater headroom than traditional 9-18 volt clean boost pedals. This high voltage internal operation is achieved while still using a standard 9 volt adaptor or battery to power the Launch pad. Separate controls for, sensitivity, + output and - output. Very easy to use. This is your "Swiss Army knife" of audio.